Soap's made with milk are rich, creamy and extra moisturizing. Part of this comes from the extra fat in the milk, and part comes from the additional proteins and ingredients in the milk itself. There are a couple of preparation steps you need to take in order to best make milk soaps - and a few different methods for incorporating milk into your soap. Important Note: When you are calculating a recipe using heavy or whipping cream, be sure to take into account, or at least be aware of the extra fat content in the cream. Heavy cream has 36% milk fat in it, as compared to 4-6% fat in goat's or cow's milk. You may want to adjust your recipe to allow for that extra fat. I cover two ways to do this on the last page of this tutorial - or jump right there now. To get started with method #1 (using the milk in place of water in the lye solution), you're going to need the cream to be frozen. - so freeze the heavy cream (or whatever milk you're using) in an ice tray. While that's freezing, we'll move on to method #2, which is using a double strength lye solution and adding the cream directly to the oils. For method #2, we're going to make a double strength lye solution. My recipe called for 5.8 ounces of water and 2.9 ounces of lye. I divided the 5.8 ounces of water into 2.9 ounces of water and 2.9 ounces of milk. Using just the 2.9 ounces of water and 2.9 ounces of lye, I made the extra strength lye solution and set it (safely) aside to cool. Measure out and melt your oils as you would in any other batch of soap. When they are fully melted, add the cream (liquid or frozen) to the warmed oils. 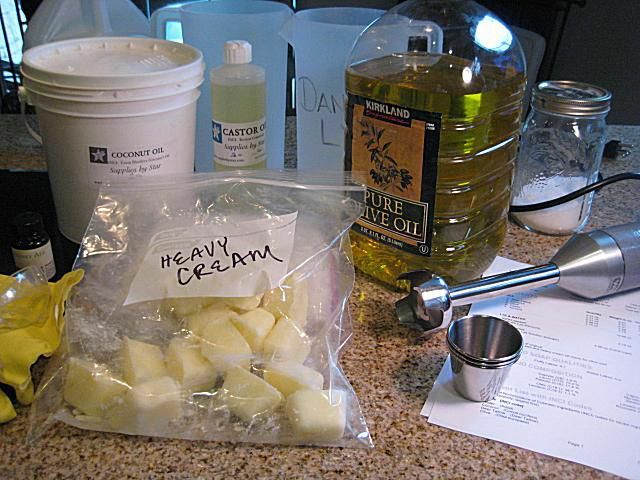 Blend the cream into your melted oils using your stick blender. You're not trying to reach any sort of trace or anything. It's just good mixing of the ingredients. Like you would any other soap batch, slowly and carefully pour the extra strength lye solution into the melted oils and cream. Blend it with your stick blender until you get a light trace. Add fragrance and/or color after you get to a light trace and pour it into your mold. Set the soap aside and unmold/cut it in about 24 hours. Now, back to method #1. Take the full amount of water that your recipe calls for and measure out that amount in cream cubes. Put them in your lye pitcher in a couple of inches of cold water in the sink. Then slowly add the lye to the cubes a tiny bit at a time. Add a little lye - stir a little - wait a couple minutes. The heat from the lye reaction will melt the ice cubes. When all of the lye is added, you'll have a lye and cream slush. Here is one part where using the heavy cream will be somewhat different than goat's milk. Because the fat content of heavy cream is so much higher than goat's milk (36% vs. 4-6%) the fat in the milk is going to start to saponify and turn into soap in the lye pitcher. It's going to get very thick - more of a lye-cream glob rather than a slush like goat's milk. Scoop out the lye-cream mixture and add it to your melted oils. Take a few tablespoons of water and use it to make sure that you've gotten all of the lye-cream mixture out of the pitcher and into the pot with the oils. Before you start stick blending, just make sure that the lye-cream mixture has fully dissolved and mash out any big chunks. Then stick blend the mixture like you would any other batch of soap. Add fragrance and/or color at trace and pour it into the mold. This batch ended up being really thick and kind of "grainy" from the heavy cream. I blended it as best I could - and then poured it into the mold. You can see the difference in how thick this batch was from the soap I made with the 50:50 blend of water and cream. Here are the finished soaps about 1 week after unmolding. The method #1 soap is on the left - you can see it's not as smooth as the method #2 batch. The color difference is from the fragrance oil - both batches were about the same color before I added the fragrance. Which method works better? They both work equally well, but I must admit, method #2 works better for me, especially with super high-fat content milk like heavy cream - you get a smoother pour and a smoother final soap. Another important note: When calculating a recipe with heavy cream, it helps to keep in mind the fat content of the cream. Heavy cream has a lot more fat than other milk - upwards of 30-36% vs. 4-5% in goat's milk. The fat in the goat's milk doesn't throw the superfat % off by very much - but the heavy cream can. If I calculated my recipe normally with a 5% lye discount and used the heavy cream in place of 100% of the water (method #1), I would increase my superfat to about 14%. If I used the 50% water 50% milk (method #2) I increase the superfat to about 9%. Calculate the actual amount of fat you are adding to the recipe via the cream, and add that fat into the lye calculation. For example - in method #1, using 5.8 ounces of cream with a 36% fat content, I added just under 2.1 ounces of milk fat to the recipe. (5.8 X .36 = 2.088). I then added 2.1 ounces of milkfat into my lye calculator - and left the lye discount at 5%. Both methods of calculation work fine - and making no adjustment to the recipe is fine too, although a 14% superfatted soap is going to be more prone to spoiling over time. Obviously, option #2 takes a lot more math and calculation, but it is a way to really accurately keep your superfat/lye discount consistent with the rest of your soaps. Regardless of whether you use method #1 or method #2 - and whether or not you adjust for the fat content, you'll find that your soaps made with heavy cream are rich, creamy and luxurious - and still lather well too.